About 60 people signed up for the jointly planned trip with the New York Railroad Enthusiasts on the Metro-North Port Jervis line. The weather was dry for the most part despite a forecast for rain. The group began the visit to Port Jervis by viewing some restored cars that reside near the station and the turntable. Lunch at the Erie Hotel restaurant was very nice. Railfan Joe Senese from Port Jervis gave us a very enjoyable and informative tour after lunch. The train ride was scenic and a good time was had by all. We look forward to doing another joint trip with the New York Railroad Enthusiasts in 2010. The New York Railroad Enthusiasts (NYRRE) and the NY Division of the ERA are pleased to offer our first jointly planned railfan trip on Saturday, June 13, 2009. We will leave the beautifully restored col-sm-6-Lackawanna terminal in Hoboken, with its Tiffany glass ceiling, and ride the Metro-North Port Jervis Line over the former Erie Railroad’s Delaware Branch to Port Jervis, N.Y. Our route will cross the famous Moodna Viaduct (3,000 feet long and 100 feet high) and through the mile long Otisville Tunnel. According to Wikipedia, The City of Port Jervis neighbors the point where the states of New York, New Jersey and Pennsylvania adjoin. Port Jervis was a port on the former Delaware and Hudson Canal. It is also known as the “River City.” The town is named in honor of John B. Jervis, the chief engineer on the canal. 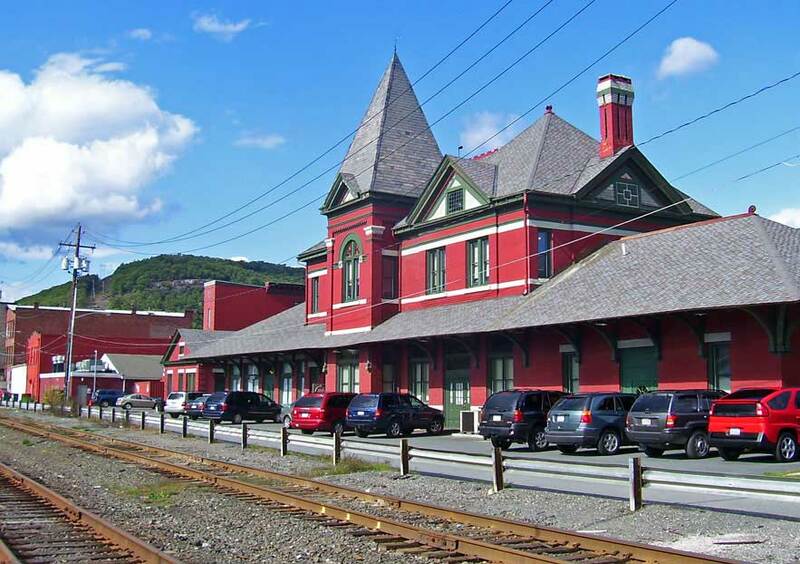 Port Jervis has a long railroad heritage, having had a large yard and Erie car shops. It was also the terminus of a branchline of the fabled NYO&W Railway. The original Erie Railroad Station, or Erie Depot, is no longer used as a train station and has been restored. There is also a turntable and the concrete remains of the coaling tower. Lunch will be at the newly restored Erie Hotel adjacent to the old station. After lunch there will be time to stroll around town. There is the possibility that a tour may be given by The Historical Society. Please join us for a very special trip. The ticket price for the trip and lunch is $46, or $38 for seniors age 62 and above. Reservations and payment are required by June 4, 2009. There will be no refunds if cancelled after June 1, two days before the trip. For further updates and information, please call 516-660-1972. To order tickets, download the flyer below.